Now owners of a small business, the travelers must now take care of their first client. Hey guys! I’m effectively a first-time GM (my first attempt was Mage: The Ascension, bad move!) and I’m gearing up for a Numenera game for my friends. To be honest, the Longshot is what made me a real fan of the podcast, as I’d had the game sort of sitting in the back of my head for a couple of years before listening, but I’m really feeling inspired to get a game going thanks to you guys. Are there any rules fudging that you’re using? Between what I think I remember hearing and what I’m trying to internalize from the books, I feel like there might be some differences. How do you like them? Second, how do you guys handle progression? I know that XP is used pretty liberally (which reminds me, you guys to give out XP more easily than the rules say, but that’s not a bad thing!) by you guys for affecting the game, but for such a long running game, I feel like you guys should have advanced more Tiers by now. This isn’t a criticism by any means, but sort of an answer to a concern of mine before I start running a game: with XP flowing fast and free, and only 16 XP being needed for Tier advancement, that seems rather fast, unless you want to get to Tier 6 and plateau/end quickly. Are you guys using a modified advancement system? I hope that this isn’t too much of a request for a peek under the hood. I’m a big fan of the podcast, and I’m super excited every time a new episode of the Longshot comes out. Lastly: any intentions of getting the new editions that are coming out in July? Maybe using whatever updates are there? If you haven’t already preordered, are you accepting book donations? Progress: Well, we handle XP differently than some. We have Temp XP that we earn for good ideas or funny one-liners. These can be spent to reroll dice, change the plot slightly, or to buy small advantages here and there. Really, these are like fate points. As for actual progression, we gain a certain amount at the end of the session. The reason it might feel slow is because sometimes are sessions are cut up into six episodes. So one session is like a month worth of Longshot. Jesus can correct me but we need four advances to make it to the next tier. We usually gain an advance after every session or two. Jesus also gives everyone the same amount because we all like to be team players. New Edition: We are considering it! Jesus is the one really looking to see if it is viable. If we don’t use it for the Longshot, we’ll probably do a one-shot with some of the new stuff to try it out. Final Thoughts: I am so happy to hear you’ve been enjoying our podcast! And that you’re going to be GMing! 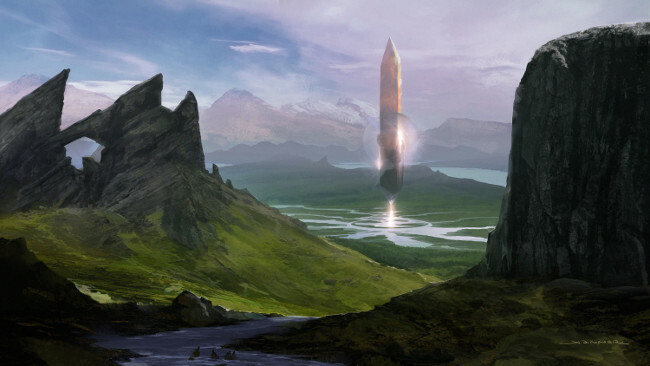 Numenera is a very rule-lite game if you want it to be. So just look to have fun and tell an interesting story, and your table should have a good time. Perfect. Thanks for the info! That gives me a lot to think about. I definitely like what you guys are doing with XP, and it might be what I was looking for to slow down too-fast advancement, if that looks like it’ll become an issue. I can confirm everything Billy just said about what we do in game. I currently did one advance per every 2 session. I did it this way because I wanted to a) have everyone level up at the same level and B) have a consistent idea of what the characters capabilities will be. Plus, it allows me to make every new tier a significant event for each character since I know when it is coming up. I can see it going to an advance every 3 sessions if the game was a bit slower paced instead of a adventure story. For example, if the team was trying to establish a new town and slowly build it up over time.